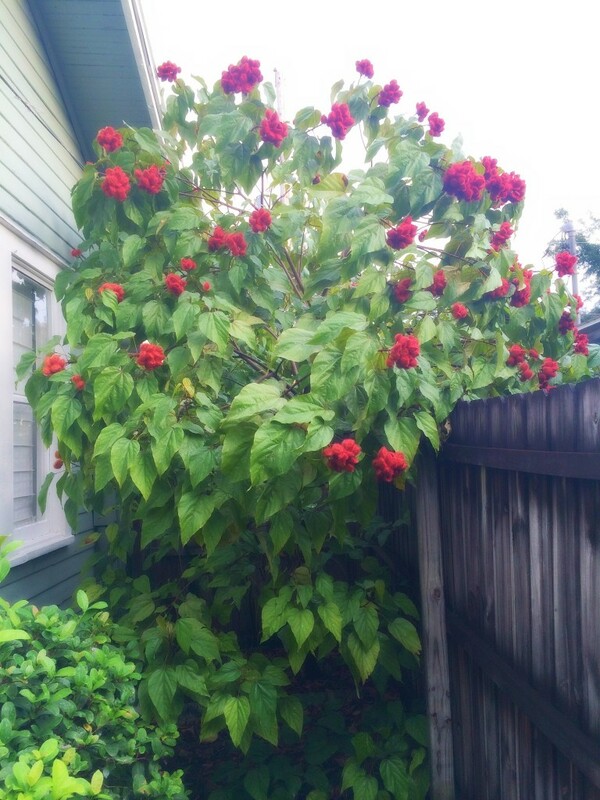 Bixa orellana, or Lipstick Tree, isn’t supposed to grow in Central Florida. It is extremely tropical in nature and shouldn’t tolerate temperatures near freezing as we occasionally experience in Orlando. Don’t tell that to these lovely Lipstick Trees! 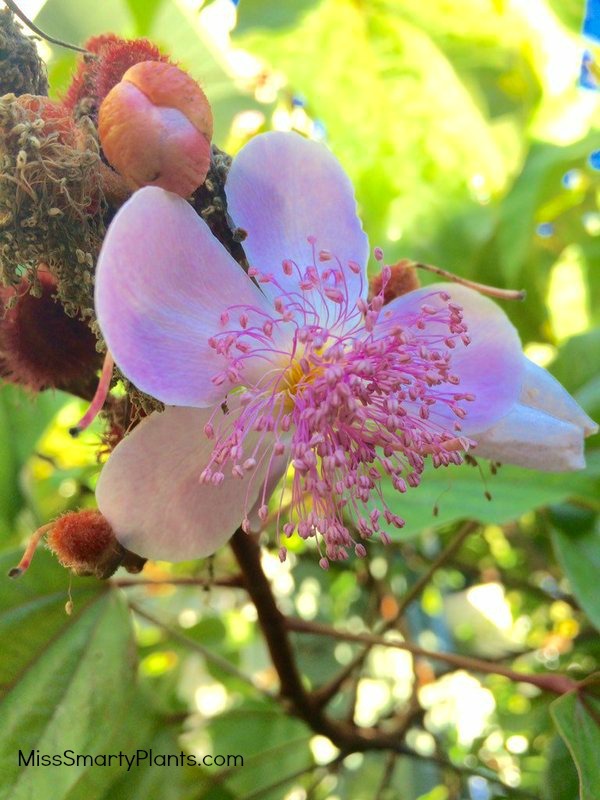 With the right care and a slightly warmer microclimate, Bixa orellana is a very interesting small tree for the home garden. Lipstick Tree, also called Anatto in some cultures, can be grown as a large shrub or as a small tree. Grown from seed it naturally has a strong stem to support the tree form, but can be pruned to a multi-branch shrub easily. 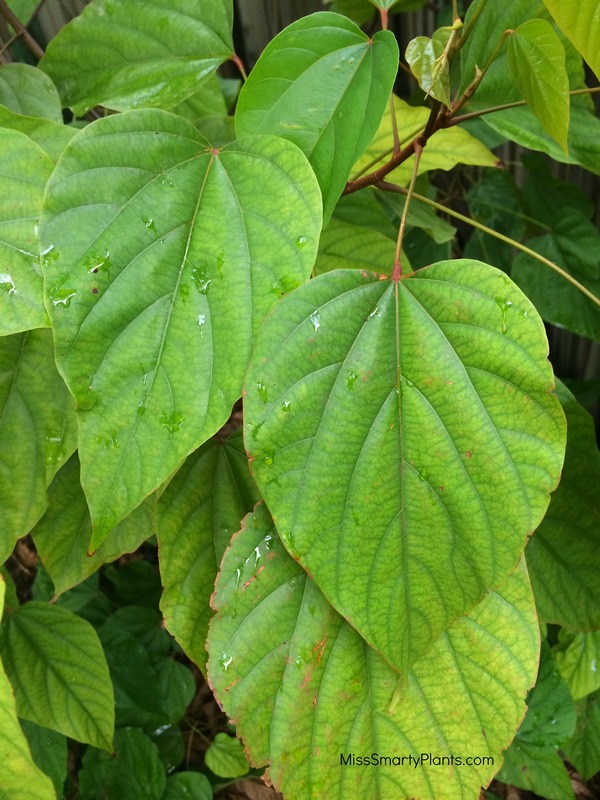 The large heart-shaped leaves are almost 10″ from top to bottom and form a dense canopy up to 20′ tall. 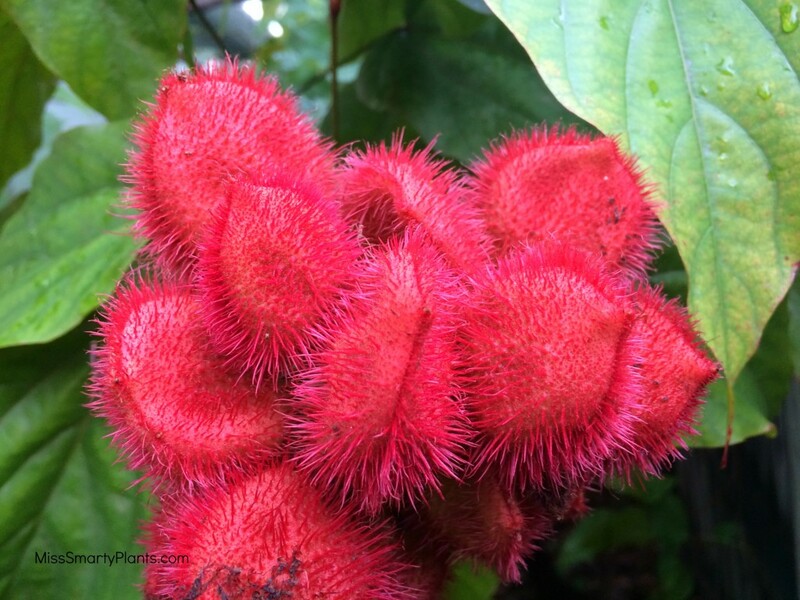 According to the National Tropical Botanical Garden, the indigenous people in Suriname have used the anatto seeds for many centuries as body paint during festivities, as a fabric dye, as a sunscreen and against insect bites. It has been traced back to the ancient Mayan Indians, who employed it as a principal coloring agent in foods, for body paints, and as a coloring for arts, crafts, and murals. 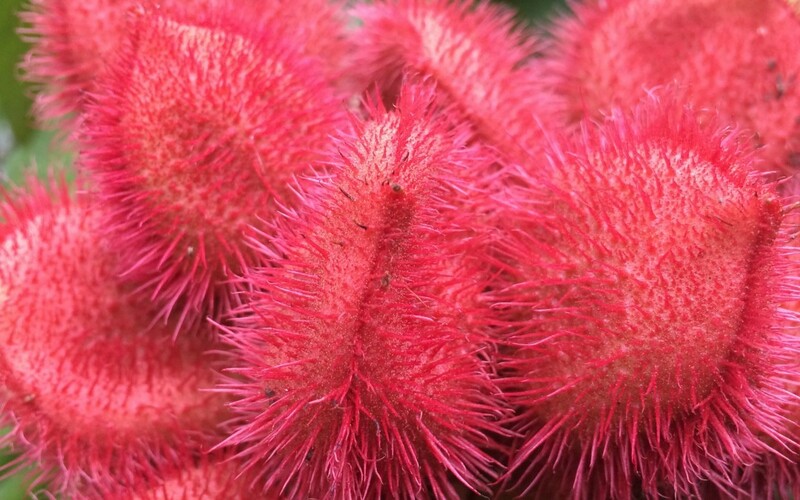 Annatto paste is also used as a natural dye for cloth and wool and is sometimes employed in the paint, varnish, lacquer, cosmetic, and soap industries. Lipstick Tree is native to Central and South America. I first saw the Lipstick Tree when I was with my classmates in the Amazon river basin of Ecuador. We saw these bright orange-red seeds and started drawing all over ourselves with them… It seemed like a great idea until we discovered the seeds are more like a stain than an easily removable paint. Ooops. 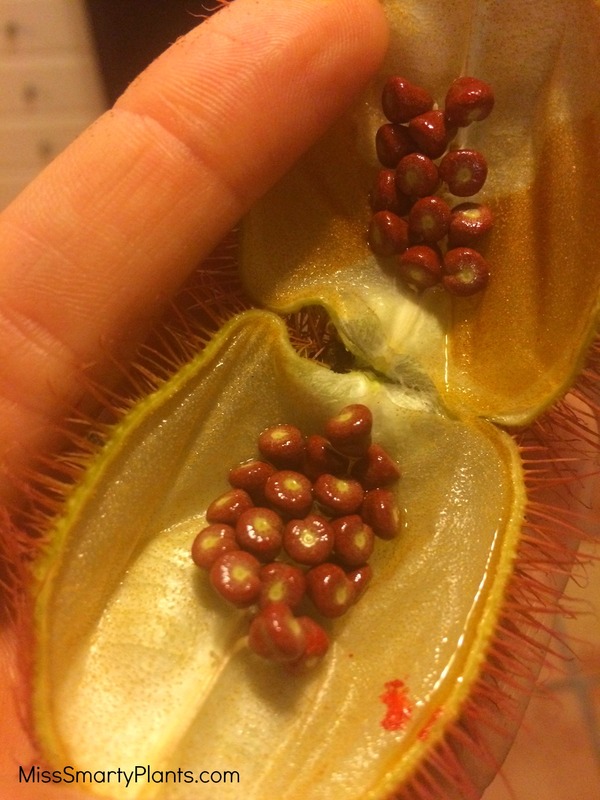 The clusters of seeds inside the large pods are easily pulled apart and reveal the bright pigment when crushed. 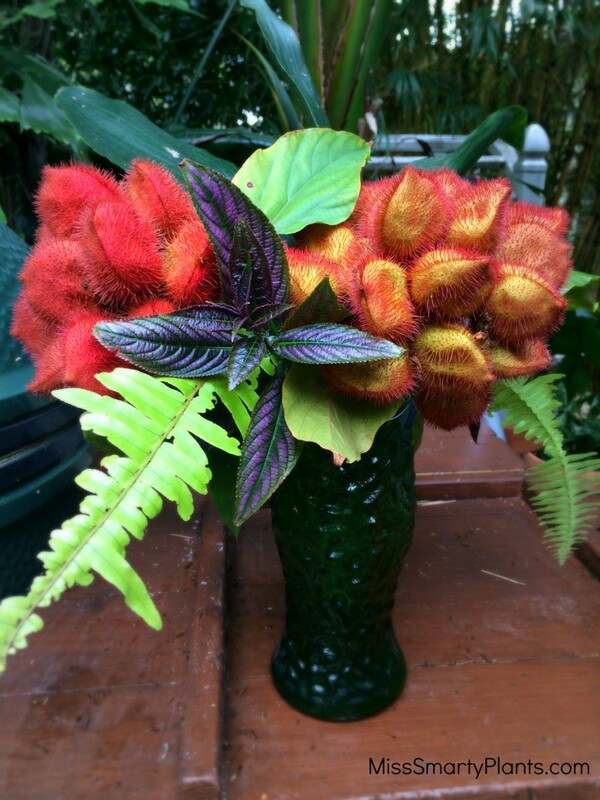 I was delighted when several years after seeing this growing in Ecuador a friend gave me a very small plant. I grew this plant in a pot for the first year, moving it inside when the weather was cool. It didn’t take long before it had outgrown its container and I decided to plant it in an enclosed nook on the side of our house. This side yard is a perfect place for a cold sensitive tropical tree. It receives regular irrigation and is also protected from the wind that could cause damage. The flowers of the Lipstick tree are a soft pink color with a yellow center and dozens of long, floppy stamens hanging from the center. I’ve found that these are usually full of activity as bees move from one flower to another, collecting pollen and pollinating the seeds to produce their namesake brightly colored seeds. In recent years my little Lipstick Tree has grown! This year I am shocked to see how many flowers bloomed and how many seed pods are currently on the ends of the branches. The bees were all over the flower and I should have guessed the seed pods would follow. 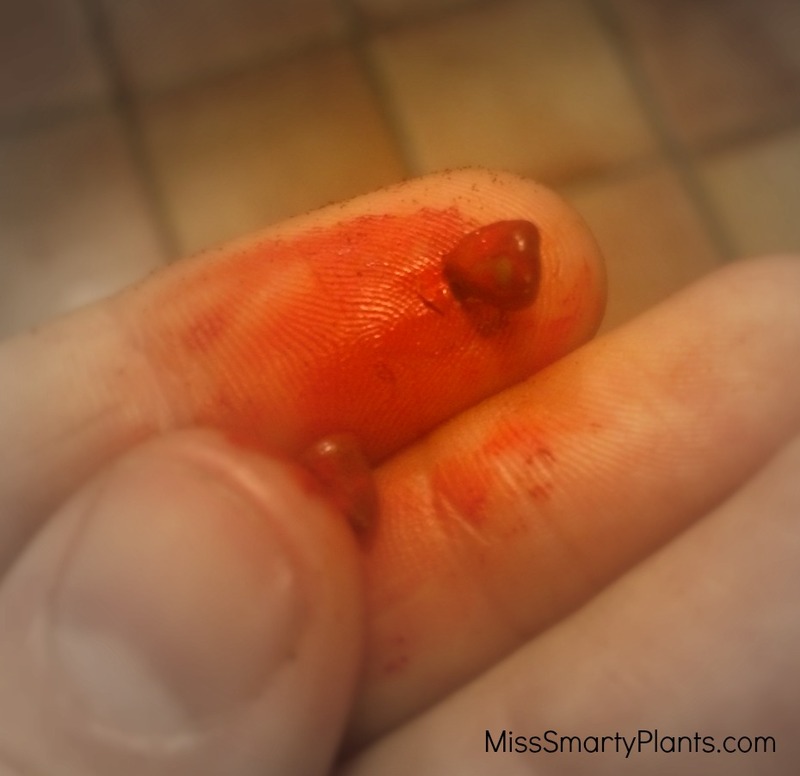 I am clipping off a few of these seed pods for a flower arrangement and I think they’ve added a fantastic texture.